If swimming with manta rays and whale sharks isn’t already on one’s bucket list, it most definitely should be. Words cannot capture the wonder of sharing the water with some of the ocean’s most majestic marine marvels – and with Four Seasons Explorer Manta Trust Expeditions, one doesn’t even need to be a diver to get in on the action. Following the success of the annual Manta Trust Expedition, Four Seasons Resorts Maldives announces the dates for the upcoming year’s manta-focused cruises: August 17 to 24 and August 30 to September 7, 2017. 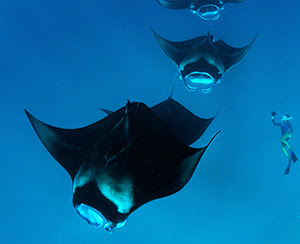 Conceived in conjunction with The Manta Trust – the world’s leading manta ray charity – and escorted by its founder and world-renowned manta expert Guy Stevens, the two all-inclusive seven-day expeditions (with the option of shorter 3- and 4-night cruises within the dates) will immerse participants in every fascinating aspect of the Trust’s research and conservation efforts. The expedition dates reflect The Manta Trust’s peak sighting predictions, based on the southwest current movements of plankton (mantas’ and whales sharks’ favourite food) through the Baa and Ari Atolls. Each exclusive expedition route will take daily climatic and environmental factors into consideration to maximise the chances of successful encounters – and with 2016’s expeditions boasting a 100 percent sighting success rate, the scene is set for some exhilarating encounters. Manta rays and whale sharks feed at the surface of the ocean, making the expeditions suitable for divers and non-divers alike. 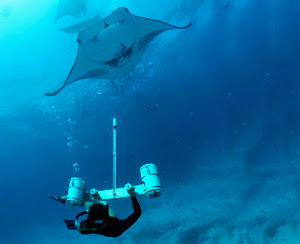 As honorary researchers, all expedition participants are encouraged to engage in every aspect of the conservation experience: learning how to freedive and take ID photos; contributing to data collection; helping record critical environmental information; participating in workshops and even naming any mantas new to the Trust’s database. Hosted aboard the Maldives’ fastest and most luxurious liveaboard, Four Seasons Explorer, the all-inclusive itineraries also give participants effortless access to a side of the Maldives rarely experienced by tourists: remote snorkel hotspots, secluded cultural experiences, isolated craft village visits, deserted sandbank barbecues, castaway beach massages, uncrowded water sports and spectacular daily sunrises and sunsets, afloat in the middle of the world’s most mesmerising aquatic nation. Based at Four Seasons Resort Maldives at Landaa Giraavaru since 2006, The Maldivian Manta Ray Project (MMRP) is one of the world’s longest running manta ray research and conservation initiatives. It is also the founding project of The Manta Trust – the world’s leading manta ray charity – established to co-ordinate global research and conservation efforts for manta rays, their close relatives and their habitats. Thanks to the work of the MMRP at Landaa Giraavaru, the Maldivian manta ray population is one of the most intensely studied in the world, placing it at the forefront of international manta ray research and conservation: most notably, the successful 2013 listing of manta rays on Appendix II of the Convention on International Trade in Endangered Species (CITES). In addition to collecting data on the manta rays it encounters, MMRP also studies environmental and climatic factors, as well as tourism and human interactions, contributing vital knowledge to global research efforts.